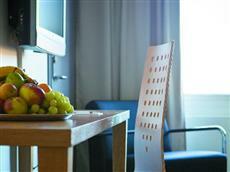 This Copenhagen hotel is ideally located for business or pleasure. Guests of the Park Inn Airport Copenhagen will be near a variety of attractions such as shopping malls and a golf course. Other nearby attractions includes Tivoli Gardens. There are also many restaurants and dining establishment located in the nearby vicinity around the hotel. In addition, guests will be able to access a variety of entertainment venues in the local area. The beaches are located within a short distance of the hotel property. Copenhagen International Airport is located within a ten minute drive of the Park Inn Airport Copenhagen. The metro line is also conveniently located nearby. Public transportation services are available throughout the city, including water taxis. Each of the guestrooms at the Park Inn Airport Copenhagen features trouser presses, direct dial telephones and mini-bars. Amenities offered at the Park Inn Airport Copenhagen include business services, a restaurant on site, bar and meeting spaces. The hotel also offers a solarium, sauna and swimming pool. Complimentary Internet access is offered throughout the hotel.